I’m a wee bit late today updating the dishcloth, several reasons being 1 I seemed to have a lot of chores to do this morning and 2 I only finished off the last few rows of this cloth this week. 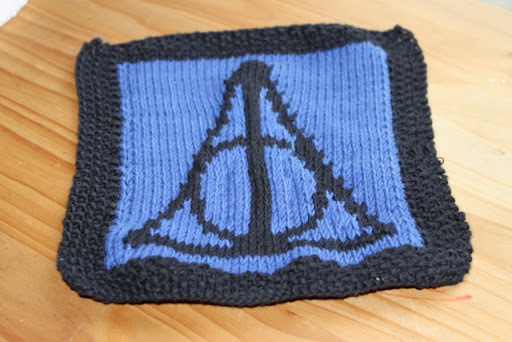 As you’ll recall from last week I was starting the Harry Potter themed facecloths for the children this week. I put all the names in a tub and hubby pulled out a name and it was Alan so he got his cloth knit this week. I got all patterns for these cloths on Ravelry but I’ll give individual links to each one each week. Alan chose this Deathly Hallows cloth and wanted it in black and blue, where the colours were put he didn’t mind he just wanted those colours so at the start of the week I faffed about trying to decide which way I wanted it and which way of knitting it up would work best for me so finally on the third attempt I got it the way I was happy with. 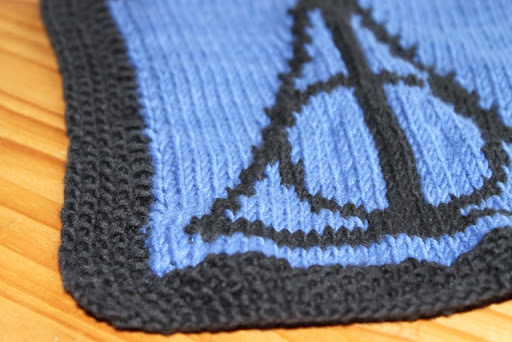 The edges are done in black moss stitch and the centre is done in blue stockinette stitch with the hallows symbol done in black stockinette stitch. I’m really pleased with how it turned out and although these may not be my personal colour choices they are extremely effective together. I used King Cole Bamboo Cotton which is 50% Bamboo and 50% Cotton. As these cloths are going to be facecloths I think the bamboo will give a softer finish and they work up wonderfully in it. I used a smaller needle size to give a tighter stitch and it could benefit from a light blocking but you’ll have to excuse it as its hot off the needles ! Hubby is going to pull the next name from the tub later today when everyone is home so we can see who’s cloth is next ! Keri’s cloth over at whendidibecomeaknitter has done a lovely circular cloth, something I’ve to get round to trying so check it out. Kim Page after Page has done an Elvish Leaves cloth in red, I love it, its a combo of one of my favourite patterns and colours. Tricia over at Tricia’s Craft Box is working on Little Garden Girl in the most adorable pink ! check it out, its gorgeous. My best friend Lucie has started knitting dishcloths also, why Tricia and herself think I am to blame for roping them into the addiction that is dishcloths I’ve no idea rofl, when she shows some of hers I’ll let you know and she’s already done some wonderful ones. 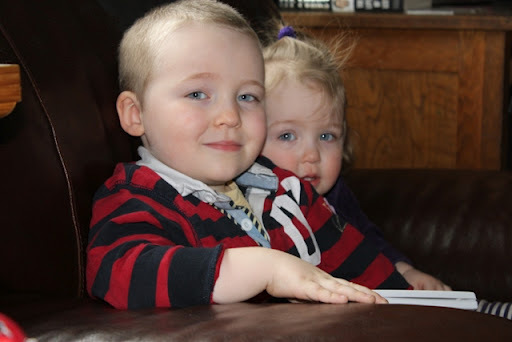 I leave you now with some pictures I have taken during the week of Ruairí and Elizabeth they were having a quiet moment together in the chair…probably planning their next mischievous act..don’t be fooled by their innocent look, these pair together keep a body on their toes. I realised this week that Benjamin makes himself scarce when the camera comes out so he doesn’t appear in front of it to often, something I shall rectify this week lol. 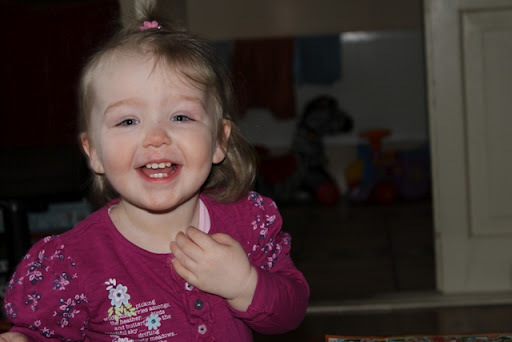 Here is Elizabeth this morning caught as she looked at me from her book she was looking at. They are never to young to develop a love of books! 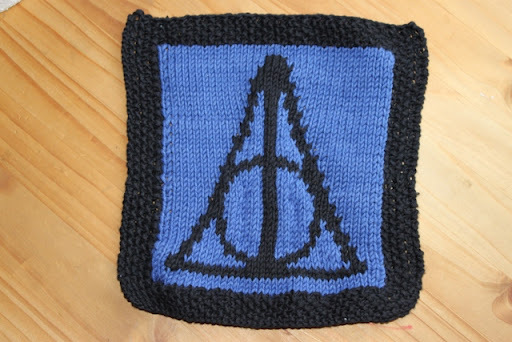 This entry was posted in Uncategorized and tagged Deathly Hallows Dishcloth. Bookmark the permalink. Alan's facecloth turned out very well. Very dramatic! Elizabeth and Ruauri are adorable Ruth. Congrats on finishing the face cloth! I love the colors. And the subject matter, LOL! Awesome facecloth! I salute Alan's taste.Ruairi (how do you say that?) and Elizabeth are so cute! Well done Alan on such a good choice, Turn out fab Ruth. Im sure your dish/face cloth list is going to get mighty big before the year is out,Ruairi and Elizabeth are adorable, cant believe how big they have got. This is the first cloth I've seen with two different colors – it looks great! Your kiddies are all gorgeous Ruth! Miss Lizabeth looks soooo cute!